You are heading for The Cross Keys Pub, 13 High Street, Pulloxhill, Bedfordshire, MK45 5HB. Not far from either the M1 or the A6. The rally site is at the rear of the pub and you can turn up as early in the week as you wish as it is a registered camp site. Most people arrive on Friday. Camping fees are £3 per tent and £5 per caravan per night and will be collected at Rally Control. The event will be signed JAWA CZ OC from nearby main roads to guide you in. Saturday will be the main day for activities as usual, so don’t be disappointed if the rally site is thinning and people are leaving if you drop in on Sunday. We always alert folk to avoid disappointment but we still get folk turning up expecting lots of Sunday action. 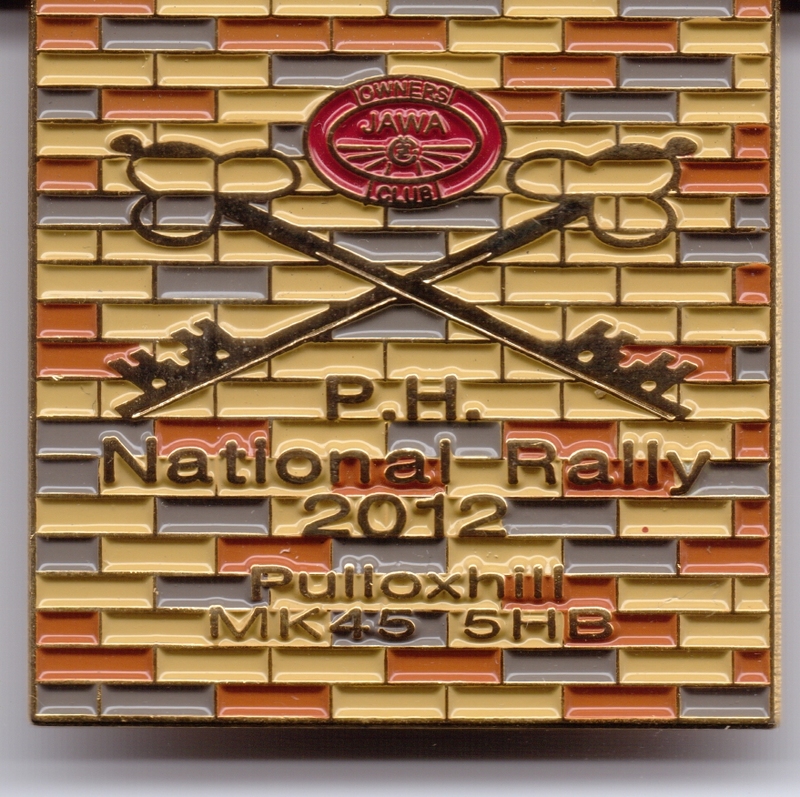 The 2012 Rally badge is one for the collectors. For the first time it is being done in soft enamel. Premier Badges (suppliers to the Owners Club for over 30 years) have excelled themselves for the 2012 Rally Badge. The Club chose a brick background as Bedfordshire is world famous for brick making. To ensure the very best representation Premier took on the challenge and following agreement with the Club produced this badge in soft enamel - another first for a club rally badge series that has included JAWA petrol tank shaped badges and a railway locomotive. Badges are normally in hard enamel. This will become another collectable for members. The events programme itself will be printed out and given out with your badge at Rally Control and will include all the regular activities including a run out on Saturday morning. This rally is more costly than recent events as we are having a marquee behind the pub so we need to make a reasonable sum on the Saturday night raffle so all prize donations happily accepted. We are praying for great weather. Pat and I went to the Peak camp on the Friday and met Jon May – when we returned Saturday evening everyone had gone. The rally site is well drained and fairly sheltered so no wimping out! Hope to see you soon. Pete E and Gary Derland our local expert. ANNUAL GENERAL MEETING will be on Rally Saturday about 5:30pm. Members have submitted no resolutions so we will be receiving reports and electing the committee. There will be one issue to decide and that concerns subscriptions. Proposal: Any subscription increase for UK members is to be determined by the committee if a change is required prior to 2013 AGM. Subscription renewals for overseas members to remain at £15 subject to receiving Torque by email or £32 for a printed magazine. Airmail premium to increase from £11 to £28 with immediate effect. This proposal has arisen due to the massive increases in postage from April 2012. A UK magazine costs 50p to post ie £5 per annum whereas one sent overseas by surface mail costs £2-20p or £22 pa. Given the increasing number of overseas members we feel unable to continue the subsidy granted in the past but do not wish to lose long standing overseas supporters.